This morning the leading commodity stocks are declining sharply after a downgrade warning to the United States was issued by Standard & Poors. The U.S. Dollar Index is also trading higher and that will usually help to deflate asset and commodity prices. Leading commodity stocks such as Freeport McMoRan Copper & Gold Inc. (NYSE:FCX), United States Steel Corp. (NYSE:X), and Southern Copper Corp. (NYSE:SCCO) are all trading sharply lower this morning. This is exactly what happens when the U.S. Dollar Index shows a little strength. Leading mining equipment stocks such as Caterpillar Inc.(NYSE:CAT), Joy Global Inc. (NYSE:JOYG), and Deere & Co. (NYSE:DE) are also coming under selling pressure this morning. 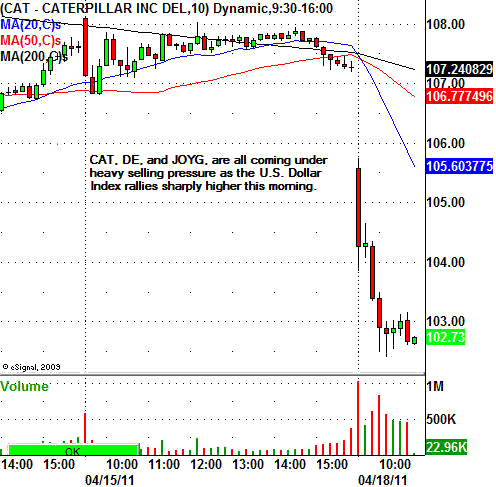 These stocks could still have further downside as the daily chart support levels are a bit lower on the charts. Traders must now keep one eye on the U.S. Dollar Index at all times as these leading mining equipment stocks will generally trade inverse to the U.S. Dollar Index. What Caused Commodity Prices to Rise Before QE?